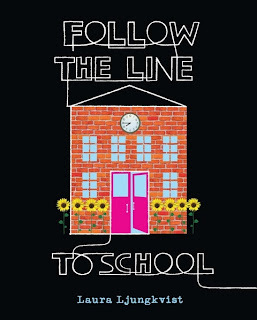 In April, I reviewed Laura Ljungkvist's Follow the Line books, Follow the Line (2006), Follow the Line through the house (2007) and Follow the Line around the world (2008). I told you how much I loved all three books, so imagine my delight to discover that Laura has a new book to be published soon, Follow the Line to school. I asked her about it, and her work in general. BC: Laura, Do you think of yourself primarily as an author or an illustrator? LL: I think of myself as a "Visual Problem Solver". Whether it's a magazine article, book cover, advertising or any other illustration assignment, my job is to convey my client's message visually. By writing my own books, I get to "solve my own problems", or be my own boss if you will. The ideas for my books always start with a concept, images and art. I think in pictures and I don't see myself as an "author" per se. BC: Can you tell us something of your background? LL: Born, raised and educated in Sweden. Worked in Sweden for 5 years as a freelance illustrator and teacher of illustration before moving to New York City in 1993. BC: What has influenced your illustration style? LL: When I came to New York everybody said my style was so Scandinavian. I guess I hadn't thought a lot about it back then, it was just what I did, but looking back, I guess they were right. I think there is a cleanliness, "light", color, and simplicity in my work that comes from having grown up in Sweden. BC: Please tell us about your new book. 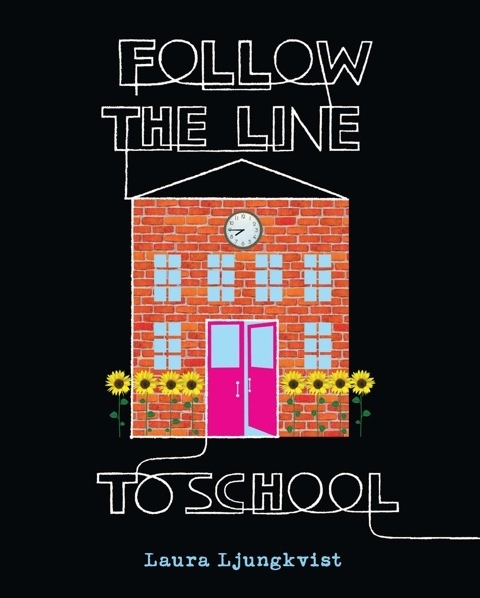 LL: I had such a blast working on Follow the Line to school! This is the 4th in this series. They have all evolved graphically and each one has its "own flavor". In this one I have incorporated photographed objects. For example, the flowers are from the Brooklyn Botanic Gardens, there is a car from Sao Paolo, Brazil and there are a lot of objects from my then 8 year old daughter's school. My daughter and I actually worked together on this book. I gave her assignments when I needed a "kid drawing". Most of the kids' drawings on the walls in the school in the book are hers! 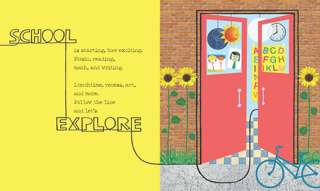 Also, in this book the line writes some words in the interior text, so when kids follow the line, they will automatically be spelling words without even thinking about it. BC: What is your aim with the Follow the Line books? I guess I'm asking you what you're trying to achieve with them. My art/work has been first and foremost an absolute passion/obsession as long as I can remember. I sat in the living room with my daughter last night, and we "solved" an I Spy book. We were never able to find that "stick of gum", but we had such a good time, talking, discussing and figuring things out together. If my books inspire to that kind of interactivity between the reader and the "read to" I would be happy. But there is something that happened a few years ago that made me take a look at what I do and why on a deeper level. BC: Laura, thanks so much for giving us those insights and introducing us to your new book.